Caw’d the hell, what a right good camping weekend. The weather was mighty kind this year, although the wind was up, possibly do to the liver and bacon casserole and beer. Martyn set off from home a little earlier this year and still wasn’t first on site, some push bike riding masochists arrived ultra early, namely Foz and Toni who made the biggest mistake by pitching close to the door. On the Friday night they probably realized their error, but then, due to the amount of alcohol they consumed nothing would have woken them anyhow. On the Saturday evening Foz moved the tent, under the pretense of confusing Toni, silly billy, Toni has a homing device fitted to you Foz, it is called a wallet. So Foz, dump your wallet and she will never be able to find you. Terry and Pat had tea, coffee and the urns out and sorted before I arrived, so all that was needed for people to turn up, which they did. Frank & Pauline and Dickie were early birds and after them came a steady stream of arrivals. 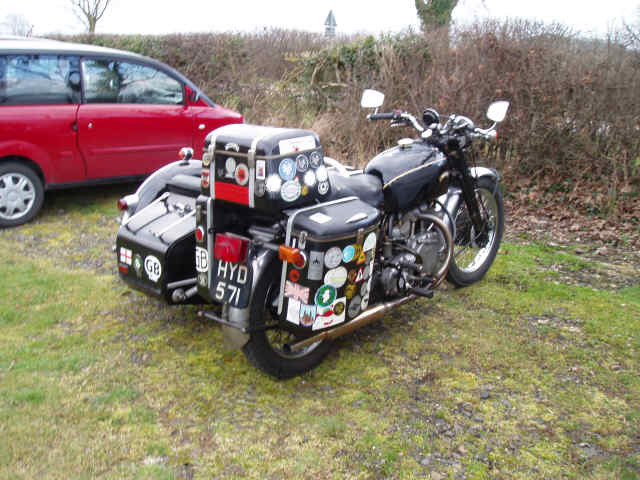 Ray Doran arrived with a somewhat well load sidecar and bike, only after unpacking did we realize Shelia was in the sidecar, I bet she can’t wait for the newly acquired RX4 to be fitted. Pearl arrived with an overloaded sidecar but that was Mick. Oz buzzed in, Ann, Jeff and David arrived via an unplanned special route. Mike P, Ray WWW, George (Gorgeous George), Dave, Carolyn and the kids on his Rocket III. Then we have the Yorkshire mob, Phil, Maurice, Adam, Steve and Alf. Paul and Jennifer from South Wales and up till now most spoke of a pleasant ride that is until the Hairys arrived, who experienced numerous diversions on the Fosse Way. Paul Money with Keith, JD and Debby all following. If Keith had entered the local ploughing match I sure he would have won. Rebo was a little later than usual, must be due to the long distance he has to travel, Denis & Chris purred in on his Pan and Sally & Richard attended by car as the Outfit was off the road. The event was well attended with a good variety of Outfits, couple of Trikes, some Solos and a couple of old bikes (more about the women later). Again this year the home made cakes were very popular, flying of the plates as fast as they were put out. Mulled wine proved to be a winner and also could be used as a hand warmer for Ann. Thanks to Ann for helping Martyn with the peeling of the spuds and carrots, Oz for mashing the spuds and both for helping to serve up the liver and bacon casserole. After the meal the consumption of alcohol was quite high by more than a few and the Friday evening seemed to pass by in a flash. Saturday arrivals were as far as I can recall Len T and Ted, Kev Wright, Norton, Mark, Jak and James, Pete C and finally Chaddy, I apologise if I have missed anyone. Plus we had several day visitors over the weekend. 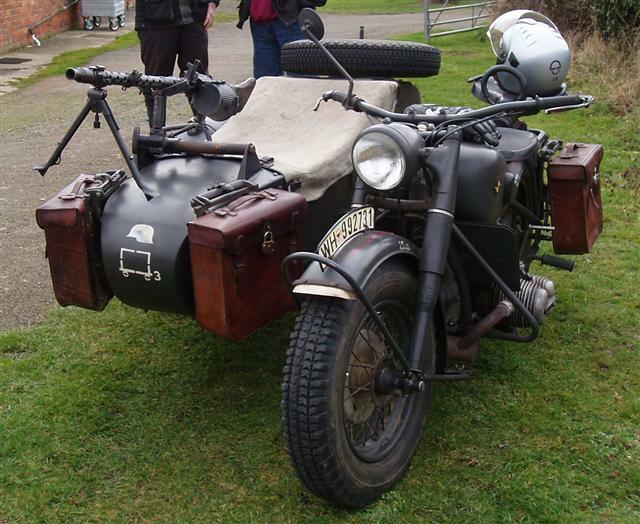 During the Saturday Mick had arranged a special day visitor in the shape of a WW2 German Army BMW R75M Outfit. 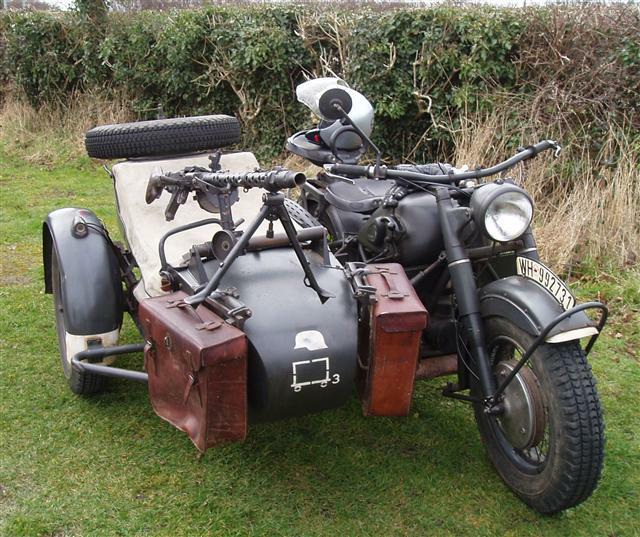 The m means “mit beiwagen” (with sidecar) and it was complete with the MG42 ( Maschinengewehr 42, or “machine gun 42”) a 7.92mm universal machine gun which entered service with the Wehrmacht in 1942. BMW developed the R75 in response to a request from the German army to make a machine more capable in off-road conditions, like the Zündapp KS 750. 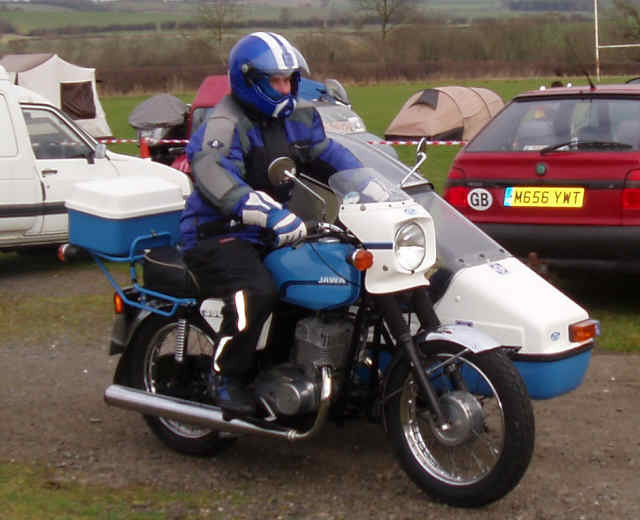 BMW copied the Zündapp KS 750 in which the sidecar wheel was driven from an axle connected to the rear wheel of the motorcycle. Fitted with a locking differential and selectable road and off-road gear ratios the R75 was highly manoeuverable and fitted with a reverse gear. 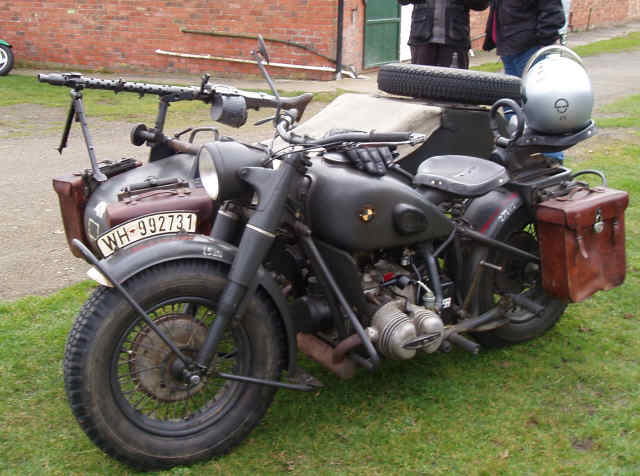 The BMW R75 was widely used by the Wehrmacht in the Eastern Front and North Africa, though after a period of evaluation it was apparent that the Zündapp was the superior machine. A standardisation programme meant that eventually machines produced by BMW and Zündapp used 70% of the same components. This simplified the supply of spare parts for these vehicles. In 1954 a small number of modified R75’s were produced at Eisenach (then in Soviet-controlled East Germany) for testing, but were not put into full production. The R75M had a Four-stroke OHV two cylinder flat twin with low 5.8 : 1 compression ratio, a bore x stroke of 78 x 78 mm (3.07 x 3.07 in). Displacement is 745 cc and max Power was around 26 hp at 4,000 rpm. Rigid rear suspension, plate springs on the boat, tube springs on sidecar wheel. An unladen weight around 420 Kg / 881 lb (Bike and Sidecar only) for more info visit http://www.bmbikes.co.uk/specpages/R75_sidecar_unit.htm The Outfit drew much attention and proved to be the highlight of the day, although I would say the full cesspit came a close second. So the first hic-up in the normal smooth running of the event came when Martyn emerged from the gents proclaiming they he believed the drains to be blocked. Pearl made it known to all that Martyn has just done a huge one and must have blocked the drains. Believe you me Pearl, if Martyn does a huge one you will see him with a big stick to poke it around the bend, so if he didn’t emerge with a stick it couldn’t have been that big. Pearl kept everyone entertained by providing a voice over to the proceedings all weekend, the only time it went quiet was when Pearl went to bed and even then Martyn swore she was talking in her sleep. What is it with holes, lift off a drain cover and everyone has got to have a look, anyhow the offending log was pumped out by the sludge gulper and all was well with the drains again, but many were certain the offending item was produced by a woman, as it was a floater, therefore it must have been full of gas (I wonder who was full of hot air over the weekend). The tantalizing quiz was won by someone whose name escapes me at the moment, I asked Martyn if he could find out who it was, but he said, it was some attendee who wins all the sodde’n quizzes, with a name suff’n like Bebo, Webo, Pee Bow, Finding Nero, oh well , I will have to just leave it at that. Oz won best Outfit, although this was unknown to him, but known by a few others. 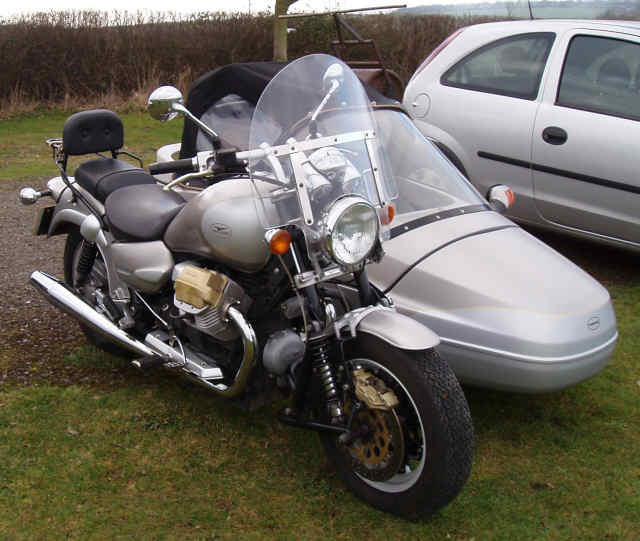 His prize was a lovely yellow ceramic mug which was placed in the front of his sidecar so it would be a nice surprise for him when he got home, he should recognize the award as he has won it on several occasions, Fed Annual and SLAC Rallies spring to mind. The main event of the weekend was the Grand Prix, as in previous years the racing was fast and furious but after the eliminating rounds we saw three finalists, Jeff Fairhead, Gorgeous George and Pearl Tribe. It was a very close finish with Jeff pipping the other two finalists at the post to win the bottle of whisky. Sunday was upon us and time to pack up and go, even though there was a heavy dag (mist or mizzle) the weather was still being kind. After all the goodbyes the tidying up began, thanks to Jenny and all who helped. 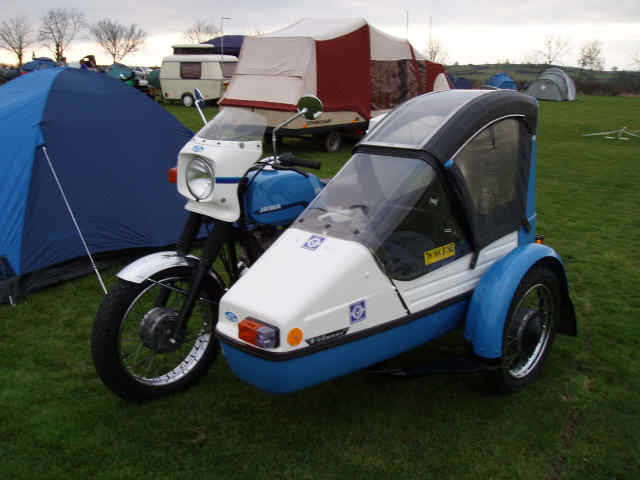 The Tri-Anglia Wheels team would like to thank all who attended and hope you had a good time and a pleasant ride home, keep a look out for more info on the Summer Sidecar Soiree.